One special night, something incredible happens! A little mouse that is being chased by a cat scurries to safety and ends up inside a home, eventually gazing at a beautifully decorated Christmas tree. 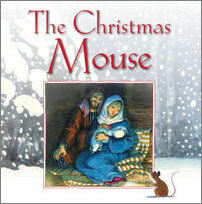 As the mouse pokes through the gifts, he comes upon a book and falls into it. To his surprise, he finds himself in the stable where Jesus has just been born. This beautifully illustrated story helps children experience the Nativity in all its glory through the eyes of an endearing observer! An excellent opportunity to share the story of Jesus' birth. Beautiful full-color illustrations will draw children's attention to the story and the message conveyed within it. Hardcover; makes an excellent gift.